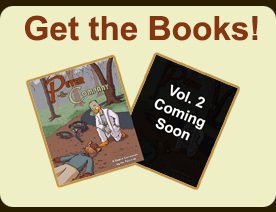 An Awesome Announcement: Be sure to check out the all-new sequel series to Peter & Company, Peter & Whitney, hosted exclusively over on the Katbox! Updates will continue for both comics, with new pages being uploaded on alternating Mondays from here on out. So if you're curious to see where the kids of P&C end up in a few years  and what will happen to Peter and Whitney in the future  make sure to follow the new pages as they come!